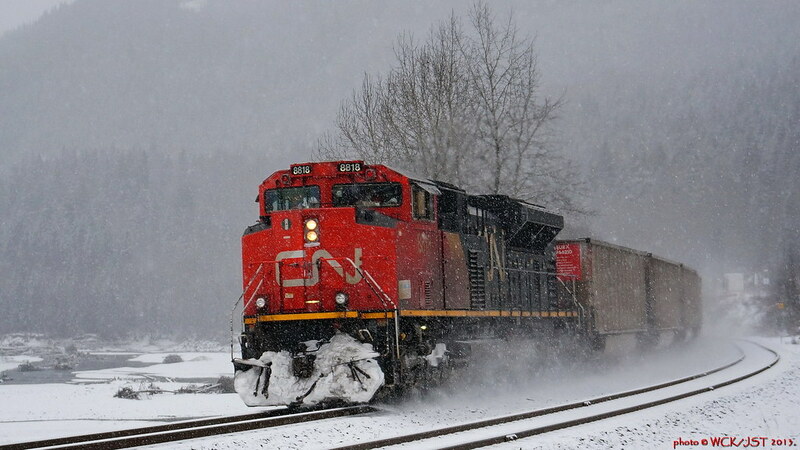 I was in Smithers on Friday & Saturday and took a few train photos on the way home. 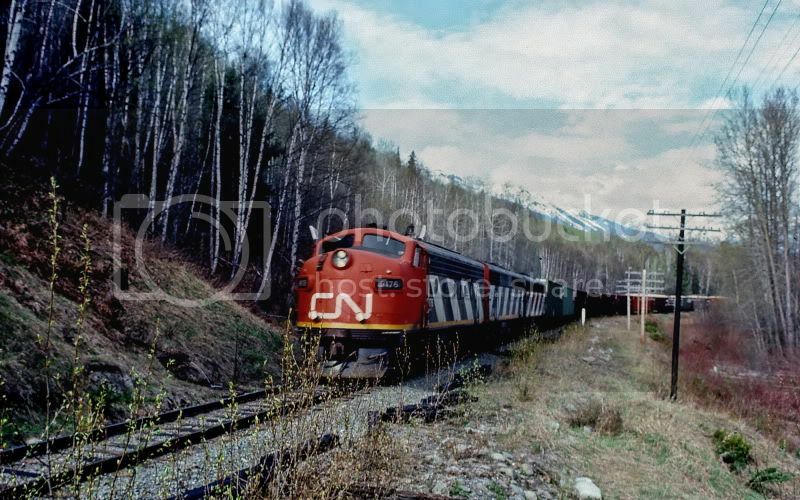 The first photo shows a CN mixed about to head out on the Bulkley subdivision for Terrace, BC. 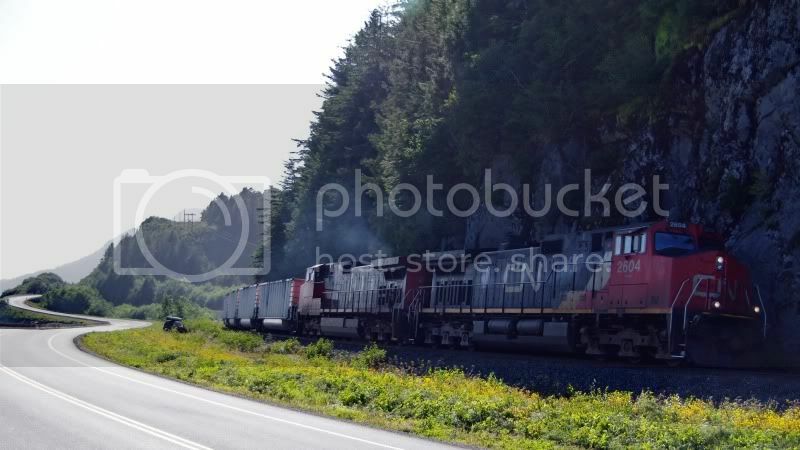 Wood chip cars just behind the locomotives are destined for the Eurocan pulp mill in Kitimat. 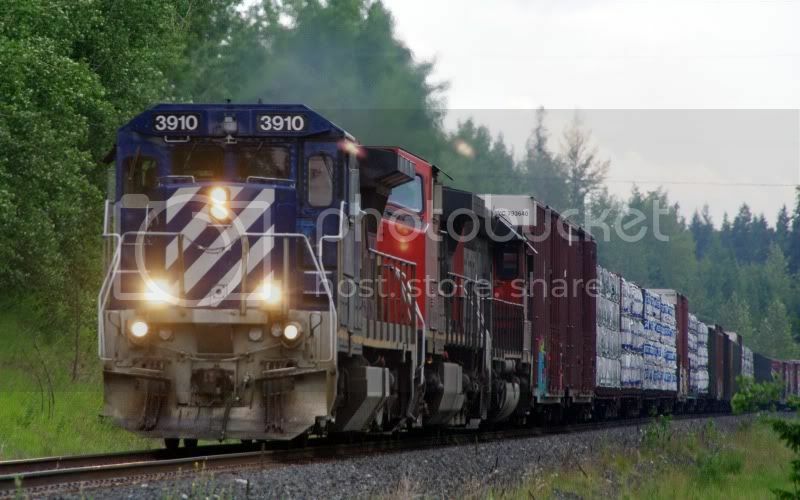 The the second pic below shows the same train moving from the yard onto the main track west bound. 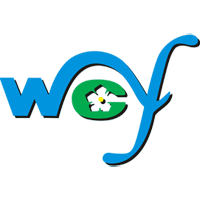 Wow, nice pictures. I like the look of the weeds between the rails in the first shot. Reminds me of the Squamish Sub just south of Lillooet. Nice pictures! I like the mood the second one creates. Some nice spring flowers on the ground with a bit of a threatening sky above. 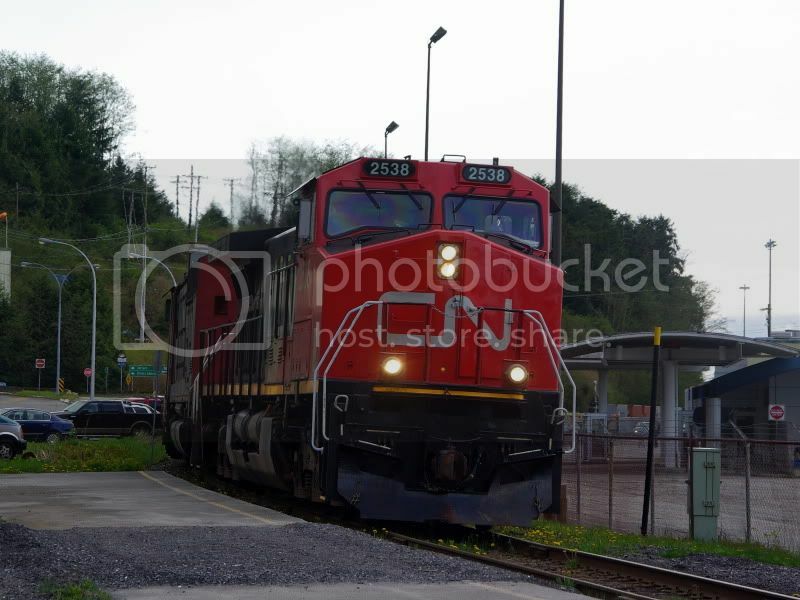 I took a quick trip out to Prince Rupert last weekend to take some ferry pictures and in the process got a few train pictures while heading out there, and when returning. 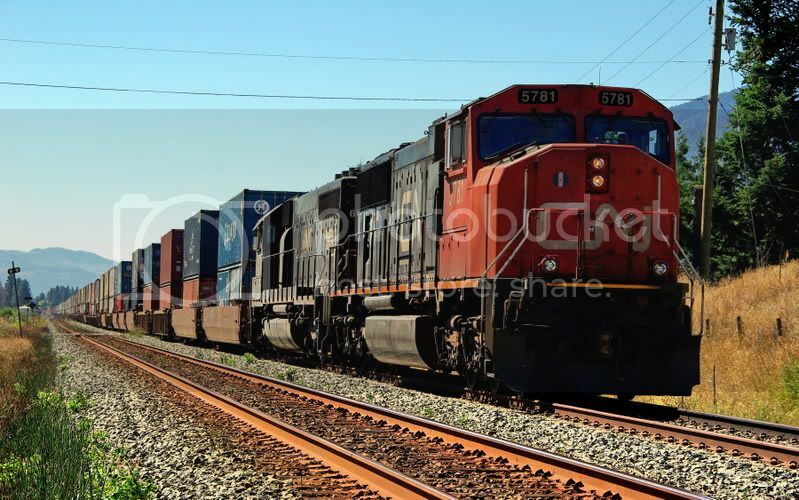 While going to Rupert I caught an east bound double stacked box train speeding by. It was very long (2 km, maybe) and moving fast (50 km/h is my guesstimate). 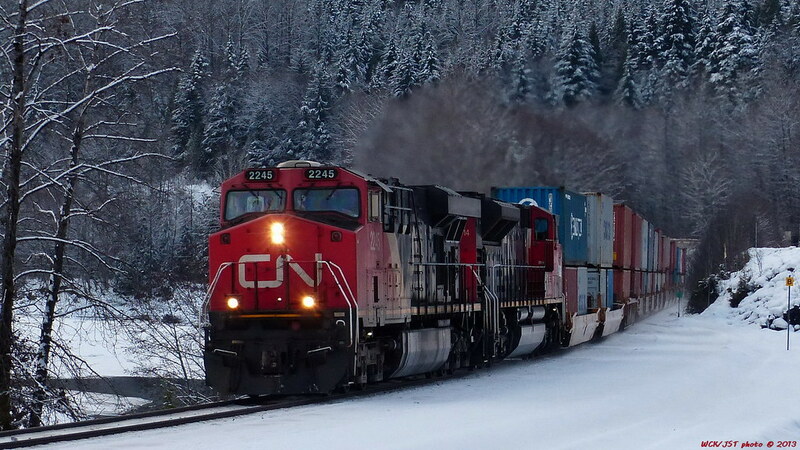 This is the first box train I have ever seen on CN's northern route. 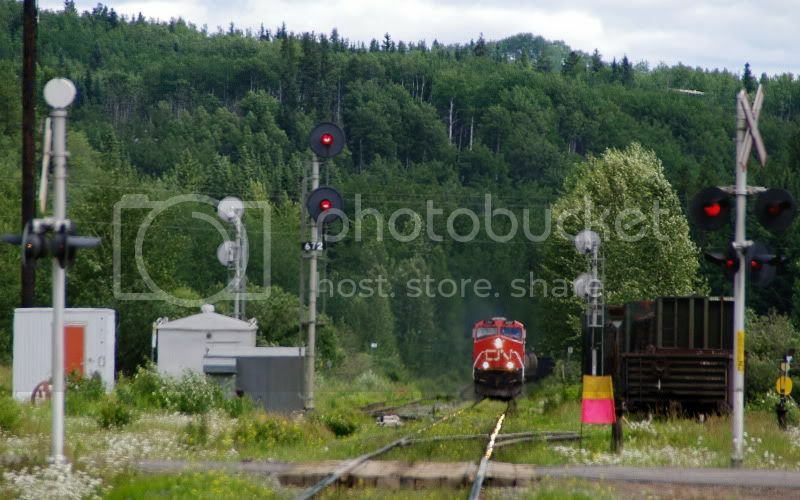 You will note a former BCR locomotive just behind the lead unit. 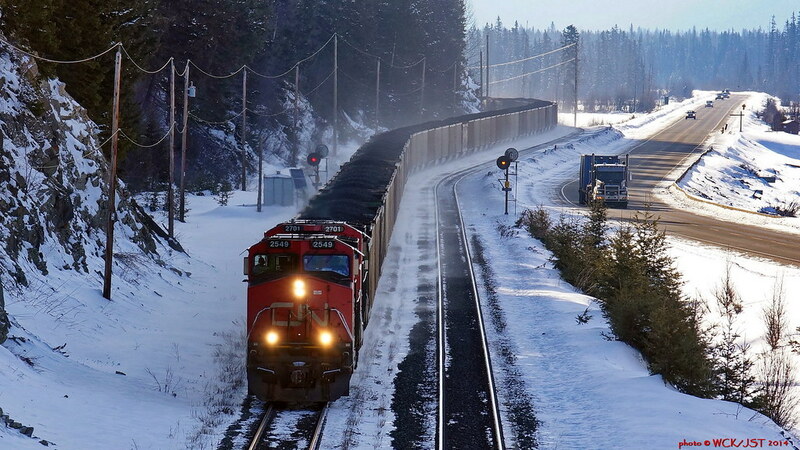 On my return inland I caught a west bound train loaded with Tumbler Ridge coal heading for Ridley Island terminals. 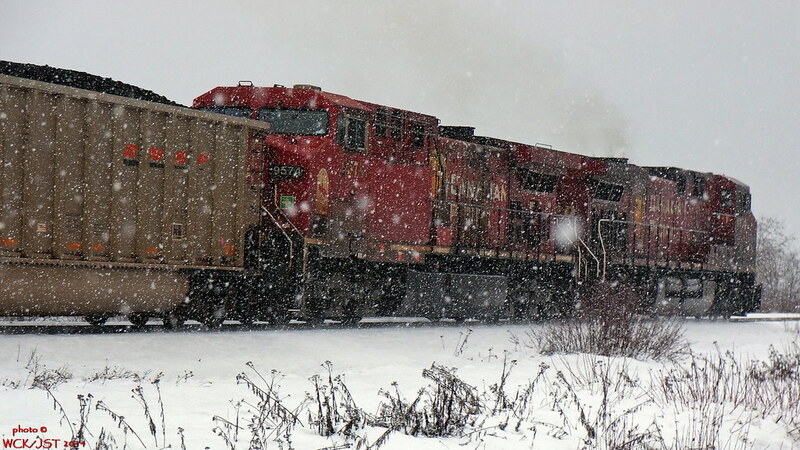 A CN train rolling into Edmonton led by two GP-38's. It was a very short train with only about 20 grain cars. Head end of CN double stack box train at Fairview Terminal. The AMHS ferry terminal is on right. 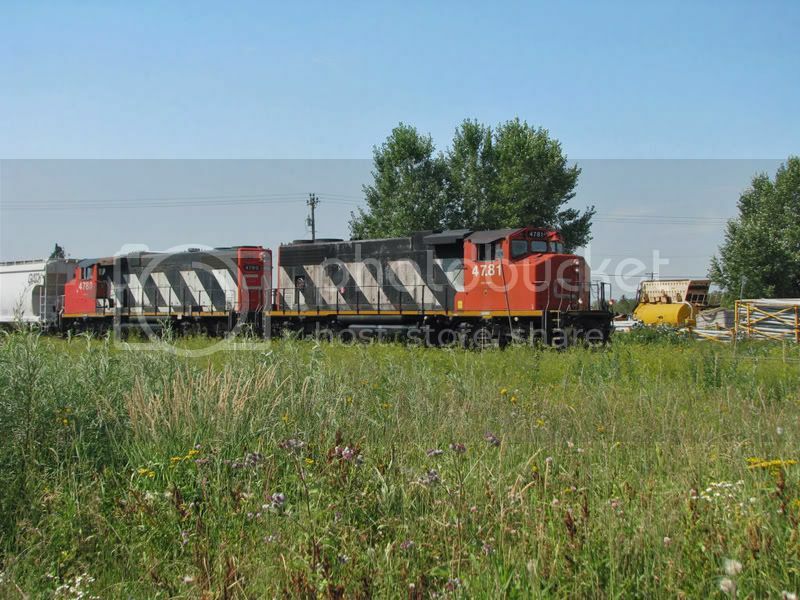 Speaking of CN, I saw recently that they are running remote units now. I was quite surprised. There was one unit on the head end and one on the tail end, complete with SBU. Yeah, we've been running them for at least a year on the BC South. 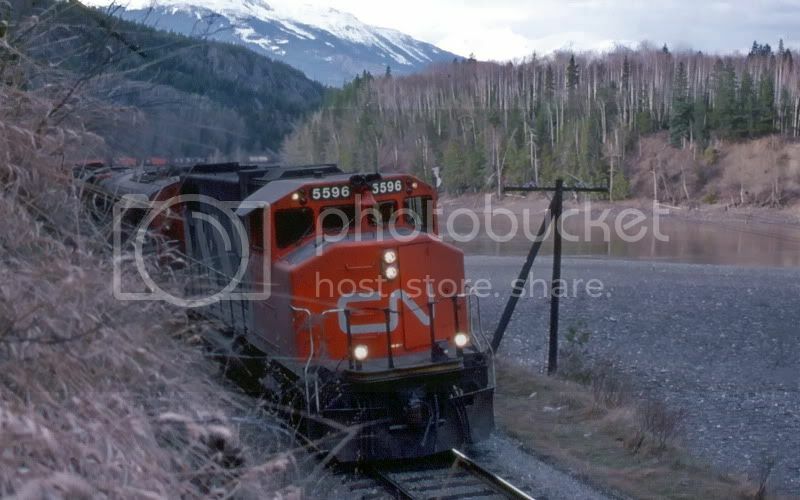 The Vancouver enginemen have been trained to run remotes for a few years before CN started running them. 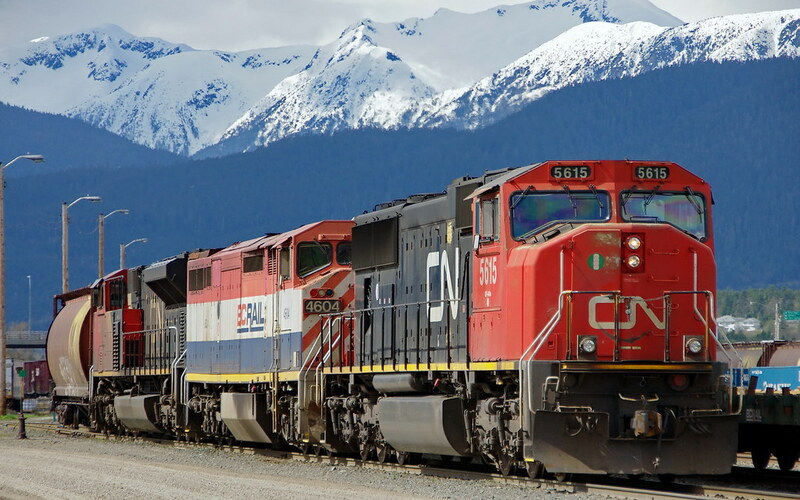 We run some trains for CP(coal and potash) from Boston Bar to North Vancouver to North Bend. CP didn't want to waste time conventionalizing the trains anymore so our hoggers were DP trained. 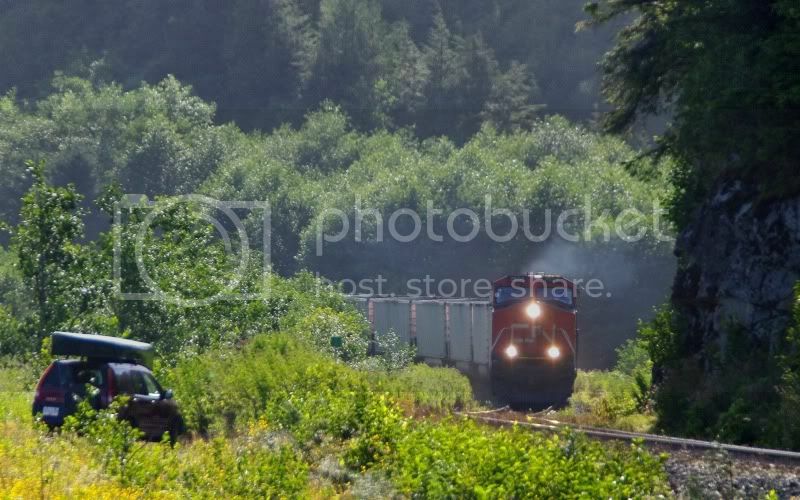 BCR-CN Northbound south of Kersley in Cariboo - 18 July 2009. 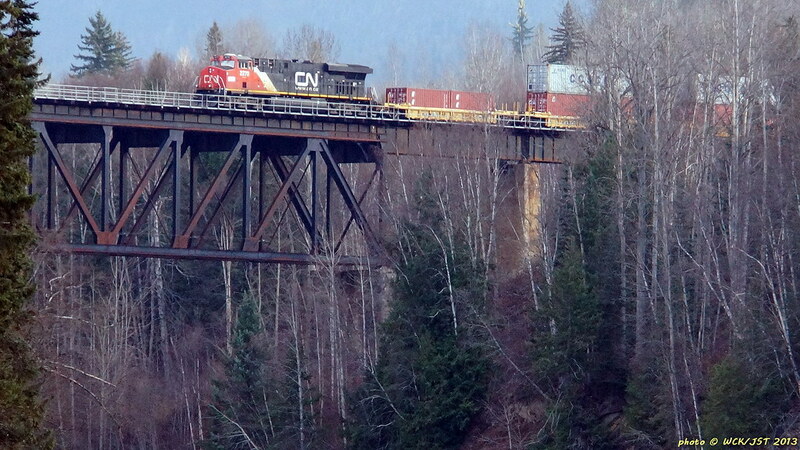 BC Rail power is now often seen on the CN routes west (& I assume east) of Prince George. 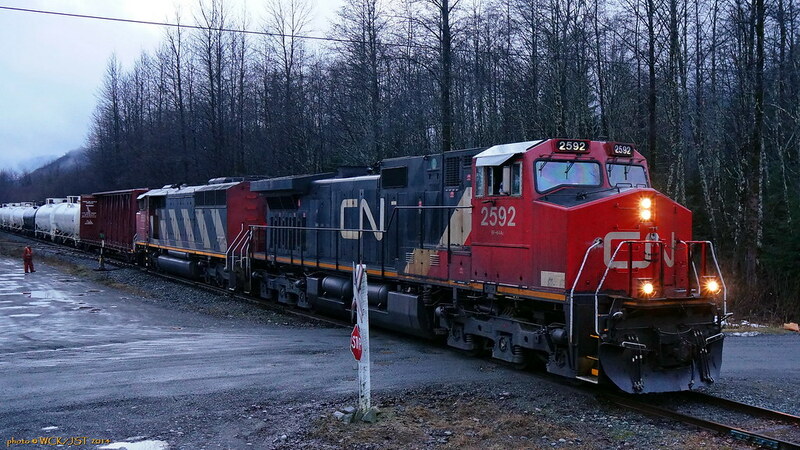 In fact just this morning I saw two BCR units at the head end of a north boiund Kitimat Subdivision freight just about to return to Terrace. 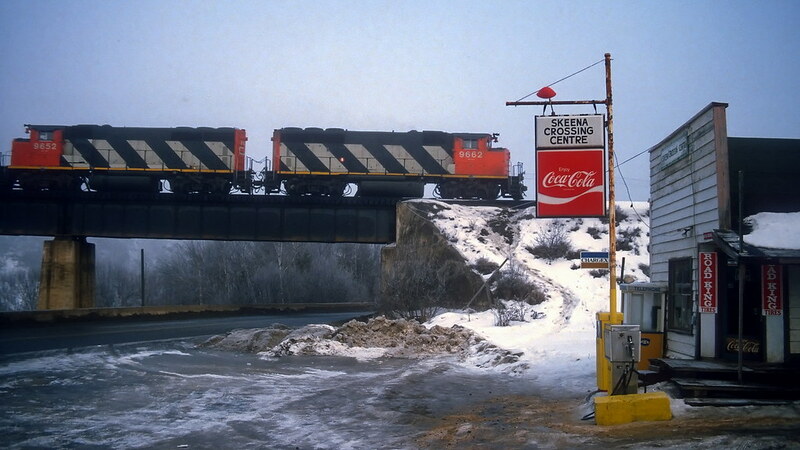 The Trans Canada - Yellowhead Highway (#16), visible directly under the locomotives, was rerouted a few years after this photo was taken. The new route by-passed the store here, which led to it being closed and pulled down. Too bad, as the place had character. 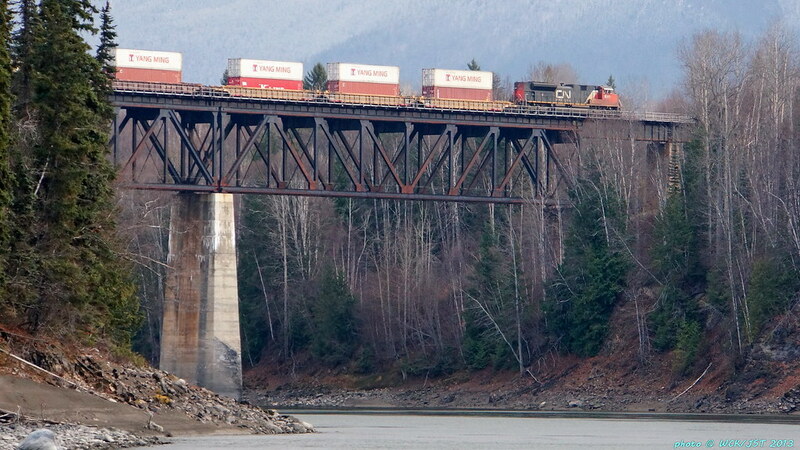 The railway bridge at Skeena Crossing is still very much in use, a full 100 years after its construction c1912. Today this bridge will carry in the order of a dozen trains daily, with the number expected to increase significantly. Here, you could watch trains while sipping on your Coke, while the store installed a pair of new Road King Tires, and you could pay for it all with your new fangled plastic Chargex card. 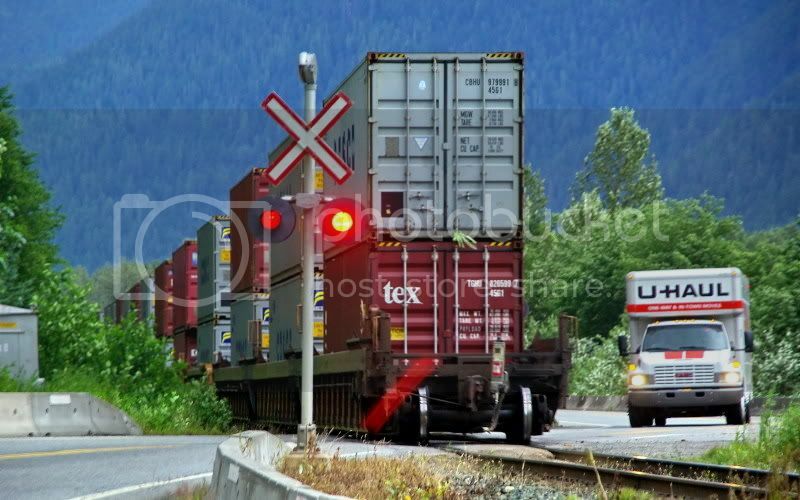 A few stills and a video of CN freight trains, southbound at Louis Creek, BC. - evening of Sept. 8, 2013 and morning of Sept. 9, 2013. Louis Creek is just a few minutes south of Barriere, on Hwy-5. So an hour north of Kamloops, along the North Thompson River. - My photo vantage point is just a few meters north of the junction of Hwy-5 and Agate Bay Rd. The area was devastated by a forest fire in 2003. I was happy to have found this nice curve location for rail photography, and for enjoying the evening and morning sunlight, as it changed the lighting in the valley and on the slopes. 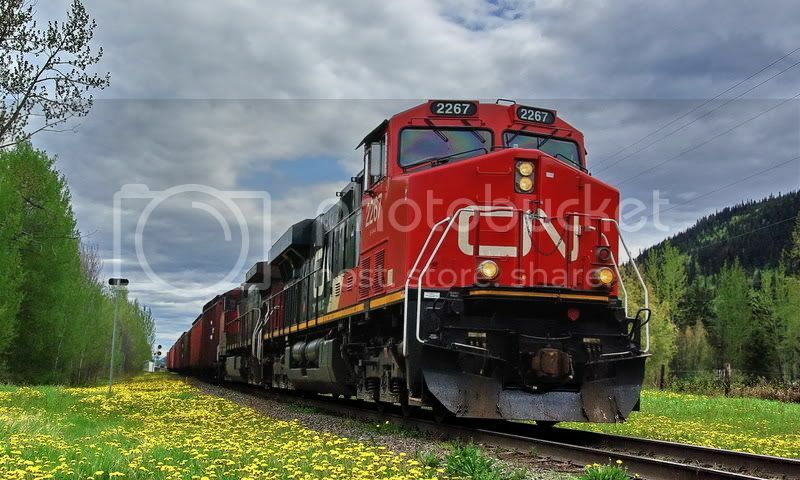 The 2 branches of CN lines in BC (and into Alberta & beyond) can coexist in this 1 thread. 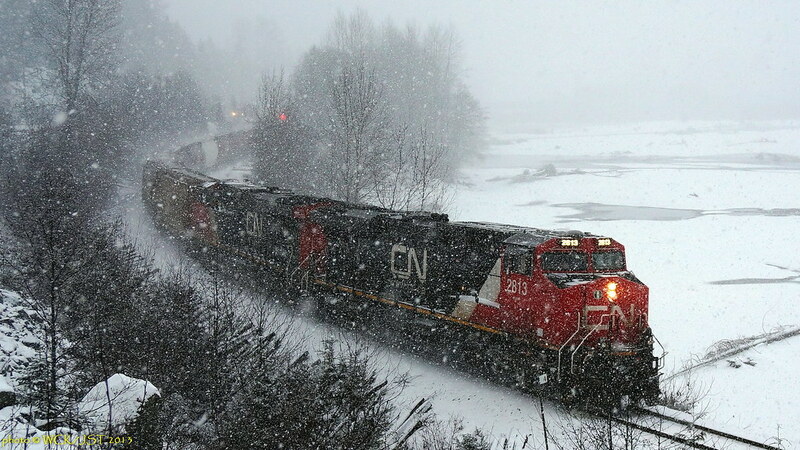 - CN from Kamloops west to Vancouver is covered in a separate thread on the CP/CN corridor. 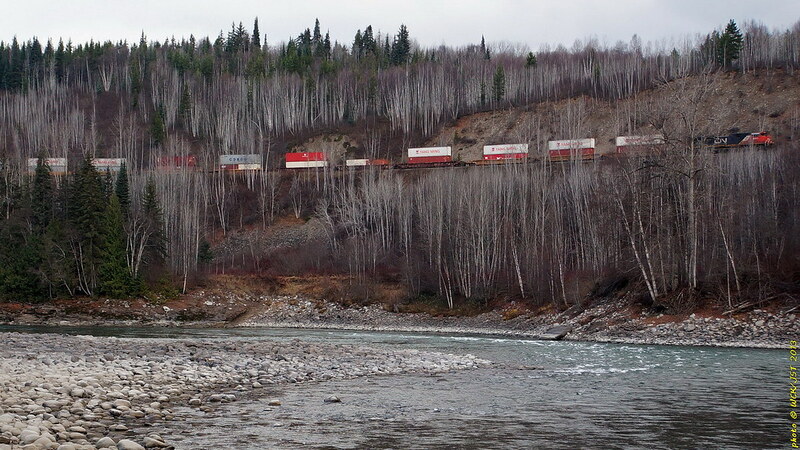 East (north) bound box train on main track at McLure, BC. 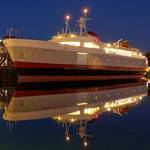 This is close to one of the reaction ferries that cross the North Thompson River. 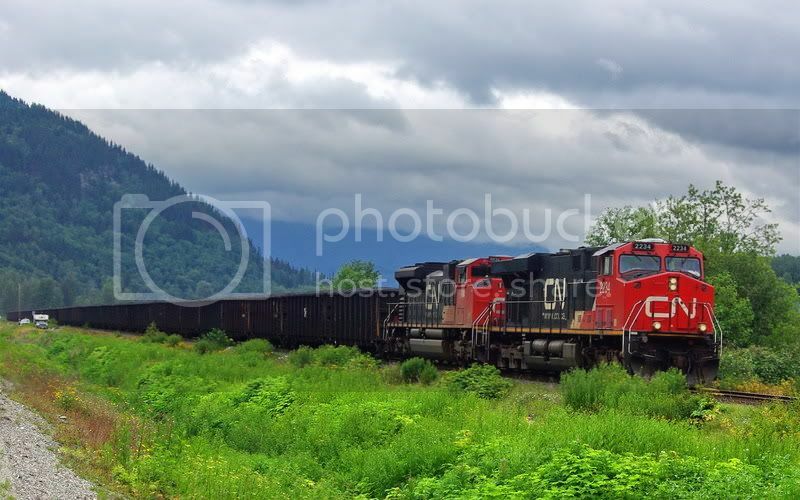 Here are three photos of an east bound box train on the Bulkley Subdivision (CN's BC North mainline) approaching and then crossing the big bridge over the Skeena River @ Skeena Crossing (aka Kitseguecla Village, BC). This is about halfway between Terrace & Smithers. These days it's hard to tell if a train is coming or going. I wish had a nice dramatic location close by to take train photos. There are plenty within reach, as Flugel would advise me, but then there is the challenge of needing a better camera and lens to shoot them, which is the constant temptation of everyone who owns a camera. I wish had a nice dramatic location close by to take train photos. There are plenty within reach, as Flugel would advise me, but then there is the challenge of needing a better camera and lens to shoot them, which is the constant temptation of everyone who owns a camera. - If I wanted to be envious, I'd definitely envy your proximity to Cisco Bridges, and that entire Fraser/Thompson corridor. I wouldn't exactly call the Cisco Bridges the Holy Grail, though. My true holy grails of rail were all gone long before I could ever have seen them. 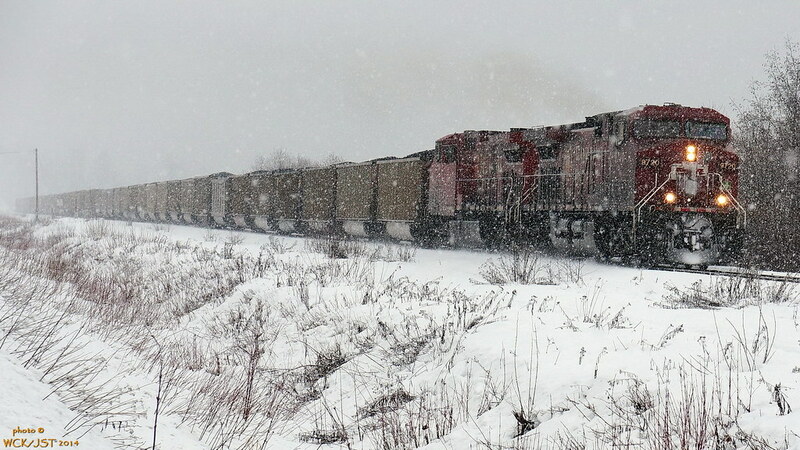 CN #'s 2813 & 2811 lead loaded west bound grain & coal train through heavy snow & over CN's Skeena Subdivision just west of Terrace, BC - 19 December 2013. This is the same train as the one in the first photo, taken about an hour later. 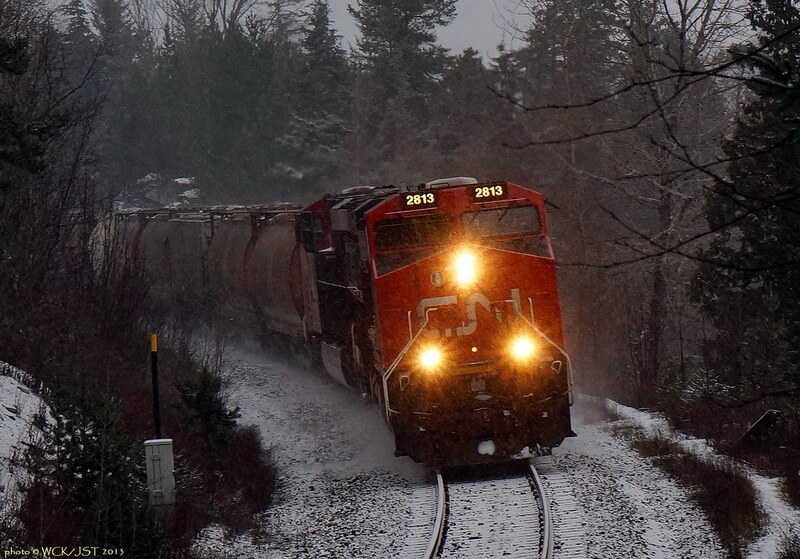 This train had to wait in Terrace for the east bound seen in photo 2 to clear the line west of Terrace. Hey, can we have some of that snow? You could put it at Snoqualmie Pass, because the ski area there is STILL closed due to lack of snow. 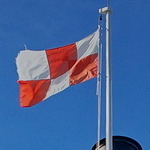 Whenever they do open, it will be the latest in the season that it has ever opened. Please send two to three feet of snow down to Snoqualmie. Thanks! Canadian Pacific #'s 9720 & 9574 power Montana (BNSF) coal westbound over CN's Skeena Subdivision @ New Remo, west of Terrace, BC - 20 January 2012. This coal is going to Ridley Terminals in Prince Rupert. 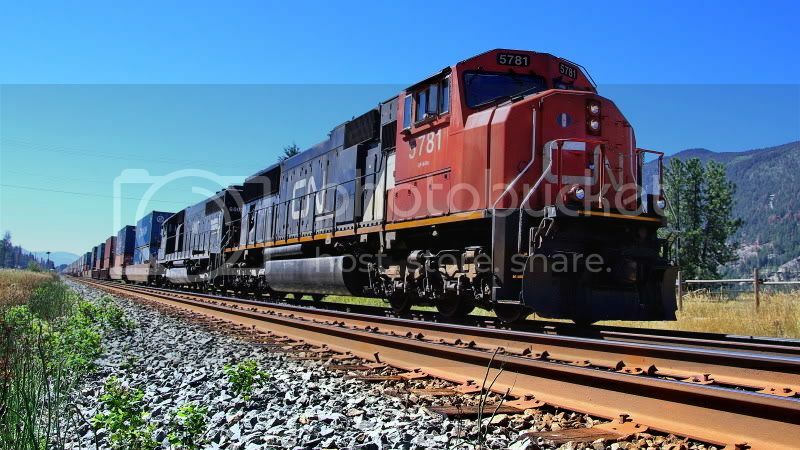 It has travelled over BNSF tracks in the USA, Canadian Pacific tracks in Alberta & CN's lines westward from Edmonton. Secondly, a few shots taken on the Kitimat Sub at Kitimat, this past Saturday. 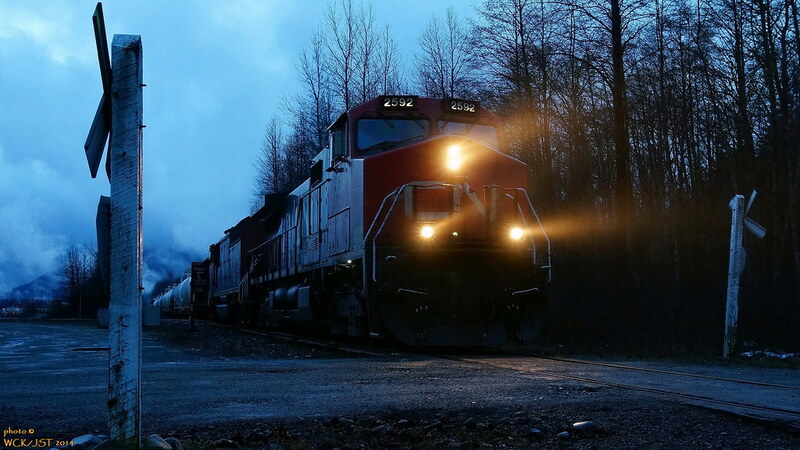 Trains on the Kitimat Sub are few these days; maybe twice a week. 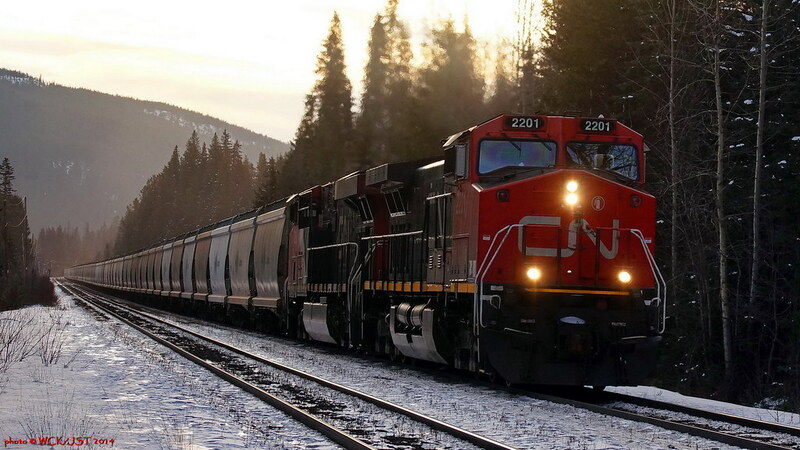 CN #2201 leads long potash train west @ Decoigne on the Albreda Sub west of Jasper, Alberta - 25 March 2014. 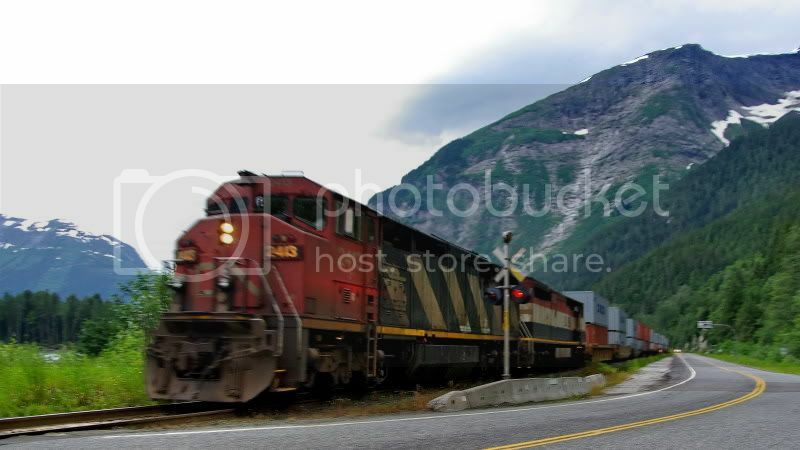 CN #'s 2549 & 2701 power a west bound coal train at the east end of Moose Lake in BC's Mount Robson Provincial Park. This is on CN's Albreda Subdivision. 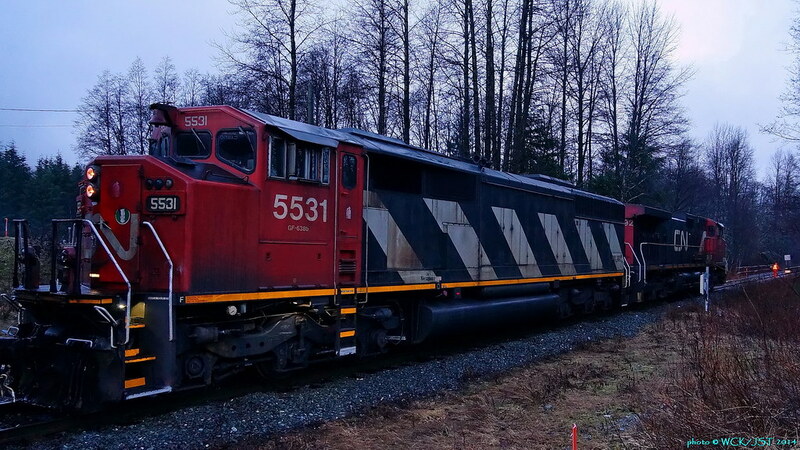 This train was destined for Prince Rupert (CN BC North). This is near Yellowhead Pass on Hwy 16 (Trans-Canada - Yellowhead route).